Ammunition: 20mm x 138belted. Brass or steel case, AP or HE depending on role. To be updated soon, scan from original manual will be uploaded soon. 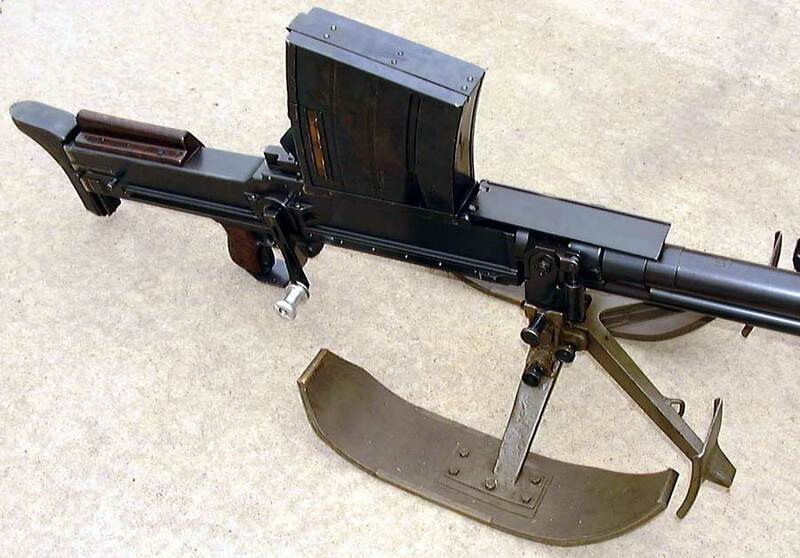 The Lahti Model L 39 20mm anti-tank rifle is a typically large, heavy weapon with a pistol grip, harmonica muzzle break and an over-the-barrel magazine reminiscent of the MK1* Boys anti-tank rifle, so heavy that it was generally towed into position then dragged around only short distances on its skis. 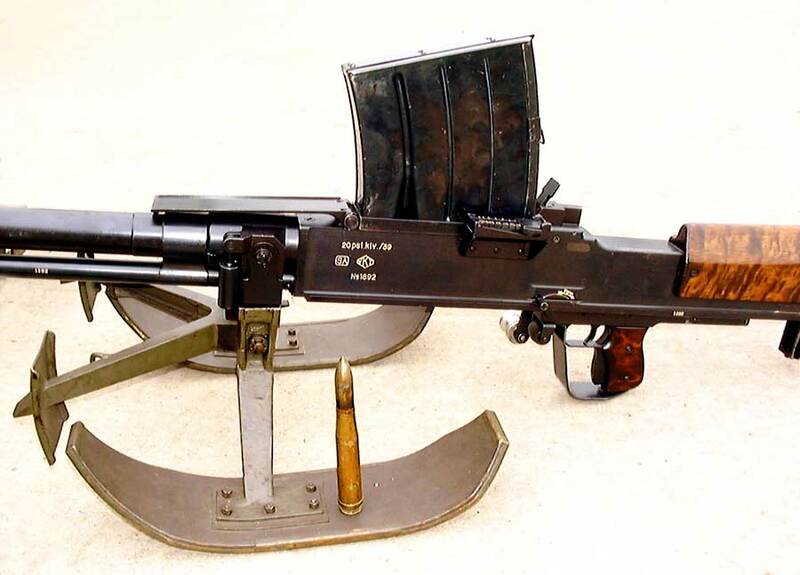 Due to the semi automatic action it was fitted with a perforated barrel jacket similar to the Browning M1919A4. The gun had spiked feet or more commonly plywood skis. A fine example of this rifle and some internal parts can be seen at the Bologne-sur-mer Nazi costal bunker in Northern France. The bolt locking mechanism is the same as the Lahti pistol although it is a gas operated piston weapon not blow back, empty cases are ejected below the receiver as per the Boys. 10 round magazines were supplied 2 to a wooden transit case and had a covered viewing slit on the right side (away from the operator but visible to the loader) to indicate the number of rounds left in the magazine. 15 round magazines were a later development for AA use. As per all other anti-tank rifles of this type the Lahti rifles were totally ineffective against any tank, although the 20mm round was, and still is, very effective against small trucks etc, however the sheer weight and size makes the rifle totally impractical for the modern battlefield and as such the Finnish MOD sold* over 1000 Lahti rifles along with 200,000 rounds of 20 mm ammunition to dealers in the United States in the early 1960s, just a few years before the destructive weapon ban was introduced. These were sold for as little as $99, complete with wooden transit case, tool and repair kit, muzzle cover, 8 magazines in 4 boxes, 100 rounds of 20mm cost $84.99! It has been reported that the remaining Lahti rifles were adapted to AA roles (and AA sights have been seen for sale) but even these were scrapped in 1988. The Lahti is now such a rare beast that the occasional example can be found for sale in the USA for roughly $10,000. Note: Some data obtained from the original Finnish 1941 instruction manual and the publication* "Know your Anti-tank rifles", by E.J. 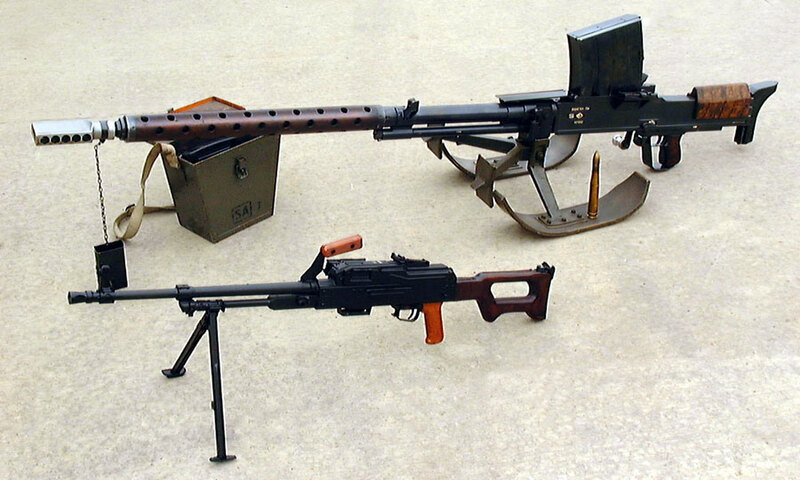 Hoffschmidt 1977 Blacksmith inc.
Lahti next to a PKM machine gun for scale. The box contains two magazines, each holding ten rounds of 20mmx 138B. Left side view, just like the Boys rifle with a vertical magazine, the rear sight is offset. 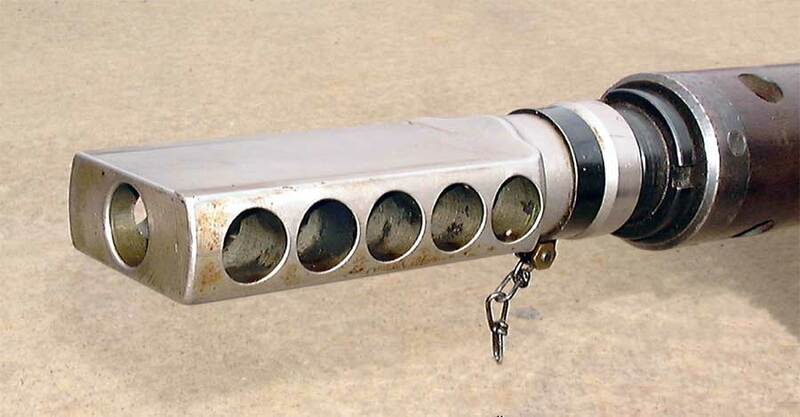 Note the harmonica muzzle break of a similar design to the Boys rifle muzzle break, it even has 5 holes per side.